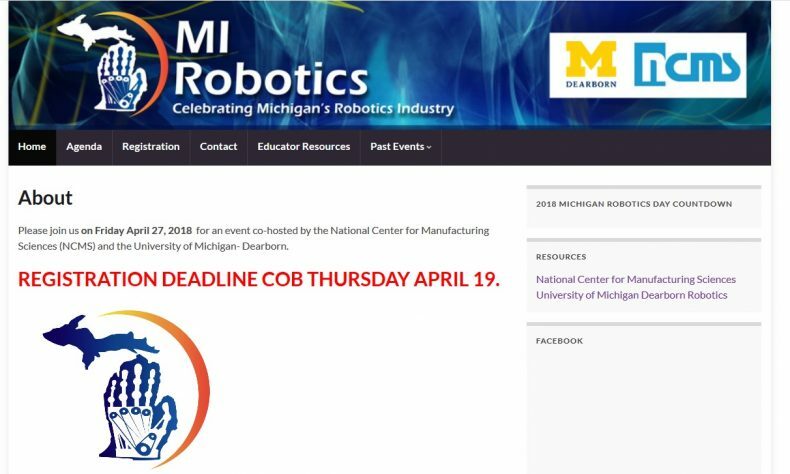 DEARBORN — The University of Michigan – Dearborn’s Institute for Advanced Vehicle Systems will host a National Robotics Day event on Friday, April 27. The deadline to register is 5 p.m. Thursday, April 19. The event is co-hosted by the National Center for Manufacturing Sciences. The day will feature keynote presentations, technology demonstrations and networking opportunities. UM-Dearborn students will demonstrate their work on an autonomous shuttle project for their campus. Presentations will include research on humanoid robotics, unmanned aerial vehicles, human-machine interaction, industrial robots, machine vision, entrepreneurship, and more. There will also be demonstrations of a drive-by-wire vehicle, machine learning technologies, smart cameras and more, along with senior capstone projects and company exhibits. This year’s event is limited to people ages 18 and older. For more information or to register, visit https://www.mirobotics.org/.